Kathleen Hooks resides in Yakima and paints moody, lush and romantic landscapes not only reminiscent of Eastern Washington, but also of the lush and deserted land found west of the mountains. She resides with her husband and 2 children in the rural farmland east of Pasco, Washington. In 1996, after a lifelong interest in pursuing a career in art, Kathleen built a studio next to their home. With her husband's encouragement and construction complete, she studied artist's techniques and made a commitment to painting full-time. After studying and painting in watercolor nearly every day for one year, Kathleen entered her first national art show and won an honorable mention. By the end of the year 2002, she had work included in 30 national juried shows, had won 8 awards, and earned signature status in both the Northwest Watercolor Society and the Eastern Washington Watercolor Society. One of her watercolor paintings was also published in Splash 6, The Magic of Texture by Northlight Books. 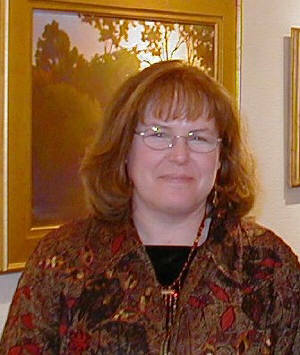 In the fall of 2001, wanting to continue learning and growing as an artist, Kathleen began working in oils as well. She traveled and painted the rural landscapes of Eastern Washington. Since that time, one of Kathleen's oil paintings was chosen to be included in the Oil Painters of America National Juried Exhibition taking place in Taos, New Mexico - May 2003. "Morning Comes to the Valley"
Please email the gallery to view more works by Kathleen Hooks.